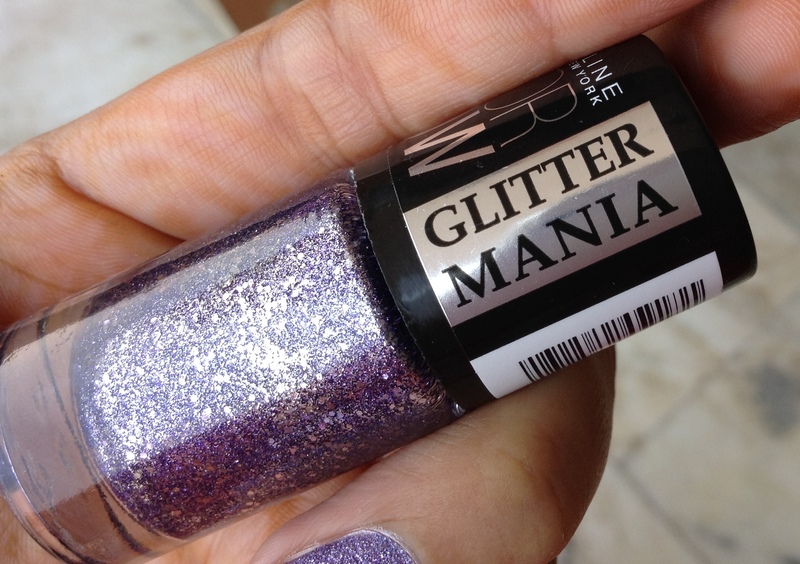 Maybelline Color show Glitter Mania polishes shouts GLAMOUR as soon as you set your eyes on them. Maybelline launched these pretty bombs in 8 shades sometime back. I’ve got a handful of them and I’m reviewing the shade Paparazzi Purple here. Paparazzi Purple is a pretty eggplant purple color with sandy texture and silver glitter. All the shades in their Glitter mania range are sand-textured. These are loaded with glitter and apply like a breeze. They spread evenly in one go and there is no need to apply multiple coats to even out the glitter on nails. I usually donot feel the need to apply another coat with these but here I have applied two coats to be safe. And the best thing these are not some glitter suspended in clear base- such polishes take more than 3-4 coats to go fully opaque. But these beauties go opaque in Just.One.Coat ! The color payoff is that good. 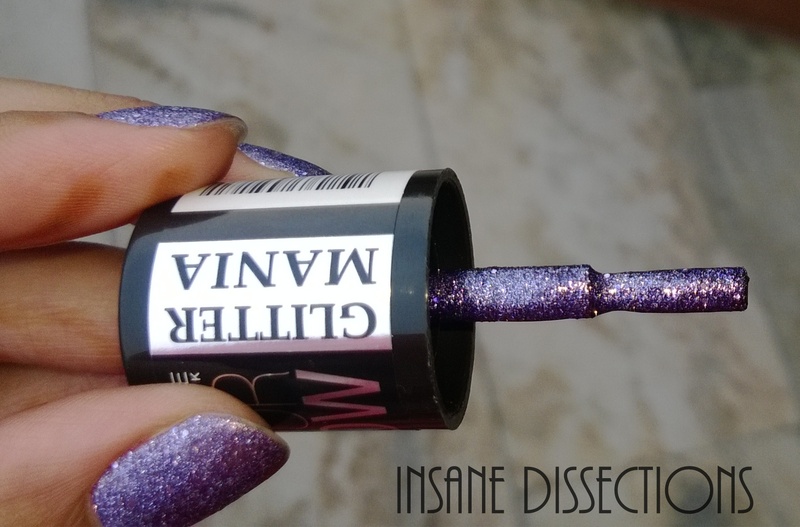 The glitter and shimmer is homogenous with the purple base and it does not tend to settle down like in other glitter polishes. Paparazzi Purple contain a mix of silver shimmer and silver glitter which are not too chunky. Though they are super shimmery at the time of application, their sheen starts to fade after 2-3 days, becoming more matte-r and less shimmery with time. The glitter particles do not fall off and do not cling to fabric. Thing I like the most in all Color show polishes is that they dry fast. By the time you finish your second hand the nailpolish on first hand has almost dried. A big thumbs up for this! The packaging is same as their regular Color Show polishes – cylindrical body, black cap with shade name engraved on the top. The brush is decent and applies good amount in one go. This polish is gritty in texture which may feel weird to touch if you are not accustomed to texturized/glitter polishes. The staying power is great. I thought they would chip easy like the Loreal glitter polishes but they surprised me. I saw tip wear by 3rd day and one can get away an entire week wearing these. Pretty shades, quick-drying, easy on pocket, long lasting- what is not to love?! One must have at least one glitter polish in their stash and these are a steal at this price for the quality they offer. By the way glitter polishes are pain to remove. I shall do a post on a super easy way to remove the glitter polishes soon. Stay tuned.